We produce a variety of original aviation-related merchandise, the sale of which is to raise funds for RAF charities. A list of our products along with prices is shown below. Please email us to obtain a total price for multilple items, details of availability, designs and any other queries regarding merchandise. Please note that pre-payment is required either by cheque payable to "ESAG" or BACS, (account details below). Images are representative only and colours/designs may vary slightly from illustrations. ESAG framed prints are reproductions of original photographs and are only available from us. Prints are mounted in a sturdy reproduction walnut frame which is included in the price. View our range of framed prints here. Be sure to check back occasionally as we are constantly expanding our range. Let us know what you would like to see added. ESAG wall clocks consist of a branded quartz movement clock. We have added a variety of aviation themed faces which include both aircraft and Sqn/Unit crests. 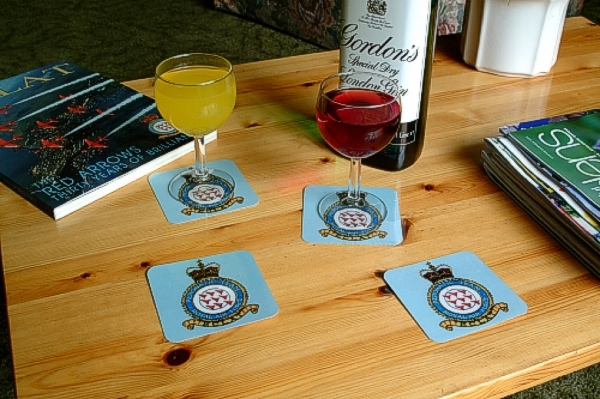 Any of the crests included in our Sqn Badge Coaster range are available and we can also add a customers' personal image, it can be literally anything subject to copyright. View our range of aviation wall clocks. Simply list your units/squadrons and stations, sit back and leave us to produce your framed personal RAF history! Please note that frames may vary slightly according to availability. Featuring RAF, some RN, FAA and AAC squadron/unit badges, the coasters consist of images on high quality paper and 500micron lamination. They are flexible, tough and just a fraction of the price you would pay for the cork-backed type which makes them ideal for Squadron reunions etc. We can also add a customers' personal image, it can be literally anything as long as there is no copyright infringement. Coasters are sold individually or in sets of 6. Please note that final image quality varies upon the original "as received" image quality. Click here for a full list of available squadrons. Please note that no VAT is charged.